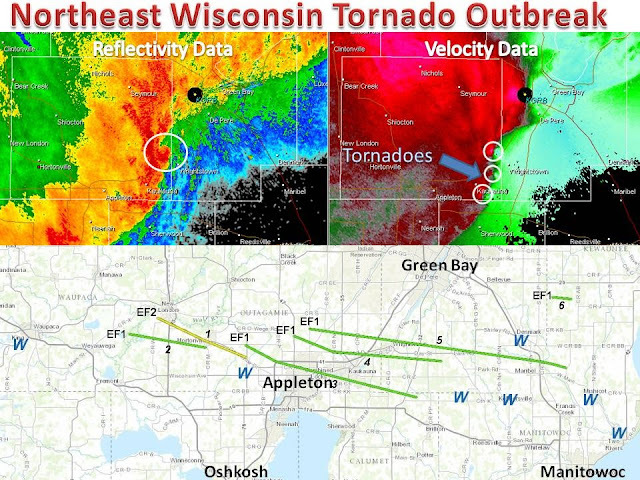 One last Recap for the Northeast Wisconsin tornado outbreak of 2013: This will go down in history the worst day outbreak of all time for this region! A line of severe thunderstorms raced across Wisconsin during the late night and early morning hours of August 6-7, 2013, producing wind damage and tornadoes in the east-central part of the state. Hundreds of homes, businesses and farm buildings were damaged. Thousands of trees and power lines were downed, leaving tens of thousands of people without power. Two injuries were reported during the storm. Six tornadoes occurred within the large area of straight-line winds, all within about 45 minutes. Below is a map of the long track twisters that hit the populated area. 1 1 mi SW of New London, 12:23 am Greenville, 12:33 am EF2 Significant damage at church south of New London. Hundreds of trees impacted homes in Hortonville. Peak wind estimated at 115 to 120 mph. Image at right is of the church on the south side of New London. 2 5 mi SW of New London, 12:25 am 1 mi S of Hortonville, 12:30 am EF1 Two injuries occurred at Huckleberry Campground, where camping trailers were blown over. About 100 trees were damaged. Peak wind estimated at 90 to 95 mph. 3 2 mi N of Greenville, 12:35 am 2 mi NE of Forest Junction, 12:52 am EF1 Considerable damage on the north side of Appleton near the Northland Mall. Roof damage at mall and nearby businesses. Thousands of trees were damaged, some falling onto homes in a nearby neighborhood. Peak wind estimated at 100 to 110 mph. Image at right is one of many homes that sustained damage from fallen trees in Appleton. 4 Mackville, 12:38 am 3 mi ESE of Greenleaf, 12:53 am EF1 Numerous trees and farmsteads sustained damage along the path of this tornado. Several homes were damaged by fallen trees and two homes had damage to garages. Peak wind estimated at 95 to 105 mph. 5 4 mi WSW of Freedom, 12:40 am 4 mi E of Maribel, 1:10 am EF1 Thousands of trees and dozens of farmsteads sustained damage along a 30+ mile long path (damage was sporadic along the path). Peak winds estimated of 95 to 105 mph. Image at right is a farm house, barn and silo that sustained damage near Freedom. 6 2 SW of Pilsen, 1:06 am 3 SE of Pilsen, 1:09 am EF1 Several dozen trees were uprooted or damaged along the path of this tornado. In addition, the storm damaged a silo and two barns. Peak winds estimated of 90 to 100 mph.